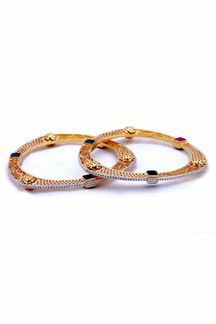 Look fetching as you don these multicolor stone worked designer bangles enhanced with rhodium border on gold plated body for a flattering appeal! Note: Please note that the Free Shipping offer doesn’t apply to any products purchased under the Accessories section. Shipping charges will apply. Shipping charges will be waived off only if the product is bought along with any product under the following categories – Suit/Sarees/Lehengas/Gown/Kurtis.